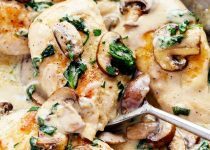 Garlic mushroom chicken is ready in 30 minutes and the this no fuss sauce will wow the entire family. In a Large skillet add olive oil and cook the chicken on medium high heat for 3-5 min on each side or until brown on each side and cooked until no longer pink in centre. Remove chicken and set aside on a plate. Add the sliced mushrooms and cook for a few min until tender. Remove and set aside. To make the sauce add the butter and melt. Add garlic and cook until tender. Whisk in the flour until it thickens. Whisk in chicken broth, half and half, white cheddar & chive garlic potato seasoning w/bacon, pepper and salt. Add the spinach and let simmer until it starts to thicken and spinach wilts. 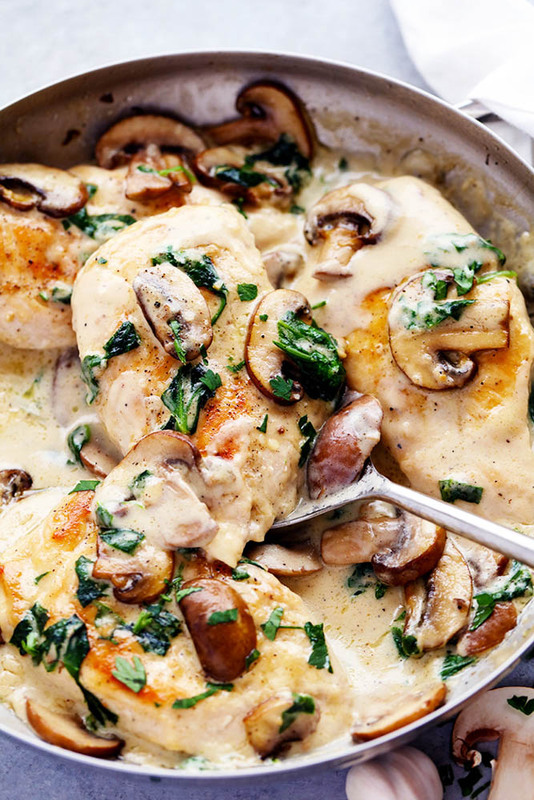 Add the chicken and mushrooms back to the sauce and serve. Garnish with parmesan cheese and fresh chives. For plating suggestion layer the flavour by seasoning your pasta noodles or rice with melted butter and the white cheddar & chive garlic potato seasoning w/bacon.